I loved wearing corduroy pants growing up; just the other day I was thinking to myself, I wonder if skinny cords exist. Turns out they do! Better yet they are trending – not that you ever “have” to wear what’s trending. I am an advocate for wearing what looks and feels good to you whether it is the latest fad or not. Back to cords, I find them apart from being stylish and fashionable, comfortable and long lasting. They are great for falls cool days and transition well into winter. They are a wonderful alternative to a jean and the texture just adds an extra layer of playfulness. 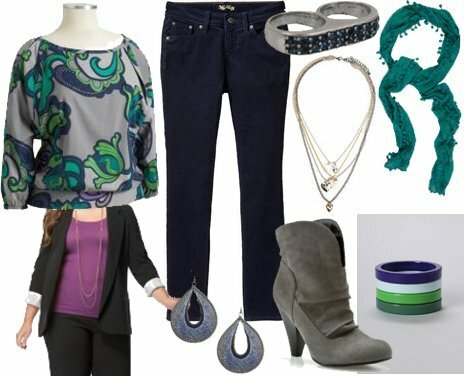 You can pair them up with just about anything and in this post, I will show you how to create a relaxed weekend look that my plus size Chica’s can wear too. I paired the navy corduroy pants with a Floral-Print Blouson Top also from Old Navy. I went with this top because it flows away from the midsection helping my bigger Chicas have smoother silhouette. I played off the colors from the top, using them as accents in my accessories. If you remember my Fall’s Must have Footwear post I mentioned that booties were one of the shoes you need this fall, which is why I went with a grey suede bootie. You could have used any of the 10 shoes from that post and they would have worked as well. A blazer is a great anchoring piece and it is a great substitute to a coat or jacket on days that aren’t as cold. The blazer is also going to create some structure and emphasize a waistline. The scarf, like with the blazer has a dual purpose, it protects against the weather and is a layering piece. You don't have to go all matchy, matchy like I did, that's something I like to do. You can be more daring and mix prints, patterns and colors to express who you are. As with all of my post please feel free to comment and if you try the look post pictures.